Heartworms are a serious disease caused by a nematode worm called Dirofilaria immitis. This worm can grow up to 10 to 15 inches in length within the pulmonary arteries, right atrium, right ventricle, and eventually the caudal vena cava. Dirofilaria immitis can infect dogs, cats, ferrets, coyotes, wolves, foxes, a potentially other animals such as seals and skunks. 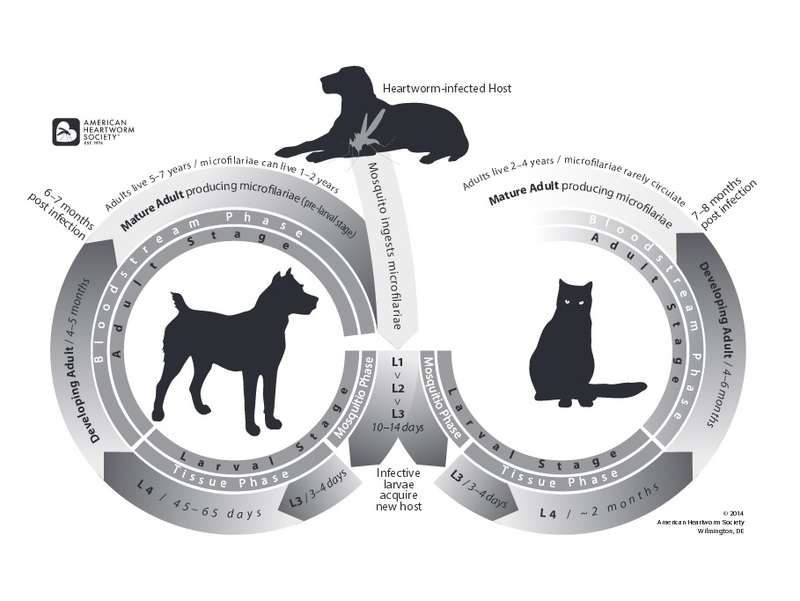 Please see the diagram from the American Heartworm Society below showing the lifecycle of heartworms in the dog and cat. Heartworms are transmitted by the bite of an infected mosquito. The larval heartworms are transmitted to the bitten animal through the hemolymph (mosquito blood) of the mosquito. When the mosquito bites the animal, the larvae emerge from the mosquito onto the skin of the bitten animal. The heartworm larvae then enter the bitten animal through the puncture wound made by the mosquito bite. After entering the bitten animal, the larval heartworms migrate though the body tissues and develop into the following stages of their life cycle finally entering the blood stream and making their way to the pulmonary arteries and heart. The adult heartworms mature in these locations and start to produce microfilariae(baby heartworms). These are then ingested by a mosquito when it bites the infected animal and the life cycle repeats. How can I prevent heartworms in my pet? Heartworms can be prevented by the monthly administration of an approved heartworm preventative or the use of an approved injectable medication (Proheart). The currently approved heartworm preventatives belong to the macrocyclic lactone class of drugs. These include ivermectin, milbemycin oxime, moxidectin, and selemactin active ingredients. Brand names include Heartgard Plus, Sentinel, Proheart, and Trifexis. These drugs affect the microfilariae, and the third and fourth stage larval worms. By looking at the life cycle above, we can see why we are able to give a once a month dosage to prevent heartworm disease. Please talk with your veterinarian about the differences between the preventatives and what is recommended for your pet. An ELISA (enzyme-linked immunosorbent assay) is available for determining if there is circulating antigen in the pets blood stream. The test checks for an antigen fro the adult female worm. These tests can be very specific and sensitive, often able to pick up an infection with only one adult female worm. Unfortunately, the tests can not pick up infections consistent of 100% male worms as the antigen the test checks for is not present in the males. The test does require a small blood sample from your pet. 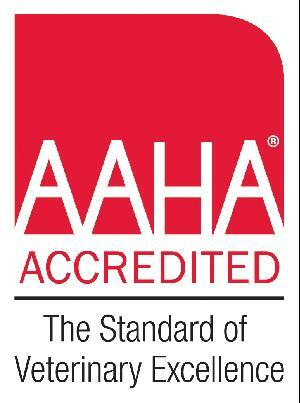 Annual testing is recommended by the American Heartworm Society. Microfilariae testing can also be performed, but is recommended in conjunction with antigen testing instead of as a stand alone test as up to 20% of infected dogs may not have circulating microfilariae. Microfilariae testing involves looking for the baby heartworms in the pets blood stream. A small blood sample from your pet is required for this testing. This is a video of what microfilariae look like in the blood smear. If my pet gets heartworms, can it be treated? Heartworms in dogs can be treated with a drug called Immiticide ( Melarsomine Dihydrochloride). There are risks involved with any treatment and it is recommended to speak with your veterinarian regarding your specific pet when planning heartworm treatment. What happens if I don't treat my infected pet? Heartworms are a potentially fatal disease. The heartworms will continue to cause damage to the pulmonary vasculature and the heart. It is possible for your pet to develop heart failure secondary to the heartworm infection. Please talk with your veterinarian concerning potential issues with your pet if they are infected with heartworms. Please discuss any questions you have with your veterinarian. You can also visit the American Heartworm Society webpage for detailed information on heartworms, preventative, and treatment.